Bring some lively and colourful fun to your kitchen with the help of Alessi! The Alessi Bunny and Carrot Kitchen Roll Holder in Green makes a cheerful display on the kitchen counter with its bright orange carrot that the paper towel sits on and the yellow bunny turning handle that both sit on a green base. This cute depiction of a bunny with a giant carrot on some grass has a cartoon quality that never fails to delight both adults and children alike. The kitchen roll simply slides over the orange carrot which peeks out at the top and the bunny can be rotated to hold the loose end of the paper in place. This fantastic design really brightens up the worktop and is even more impressive when combined with more colourful Alessi products, as shown on the right. 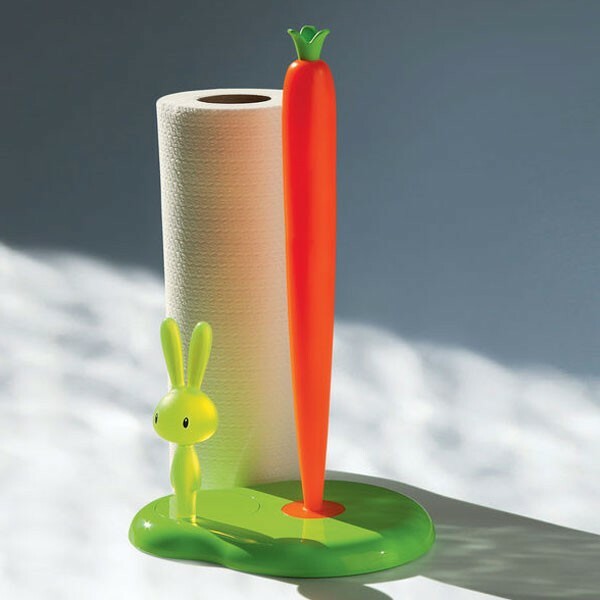 The Alessi Bunny & Carrot Kitchen Roll Holder is also available in white.